On this last day of April, snow is falling, blown in on winds from the west. The air is icy cold and white clouds that are snow laden are racing across the sky, twining themselves through mountain valleys, and releasing white flakes all around us. Winter is refusing to give up and it is thumbing its nose at spring. Our trees have yet to show their leaves and bushes continue to be without raiment. However, this is the way of life in the northern Rockies and one we all expect. I must admit, though, that Bora Bora looks better everyday. They say that good fences make for good neighbors. Methinks that good fences make for creating ones own world, all the while hiding from the unkind eyes of neighbors. With great regret, I must say that we have ended up behind some neighbors of impolite ilk. Wonderful folk live up and down our street in our little neighborhood, but located directly behind our home there are ones who are not so friendly. For as long as I can remember, wide open spaces and large vistas of sky have given me happiness. To be fenced in has never been something of which I am comfortable. Our very small yard is lovely as it opens up to a small green way behind our cottage. But, directly beyond the green way there is a home full of antagonists. Therefore, out of the great need for some degree of privacy, we are putting up a picket fence. There has developed a carelessness in our neighborhood which allows pets to run loose. This is against the rules by which we are all supposed abide. It is always sad to me when the carelessness of just a few make it difficult for the many and the many suffer so the few can have their way. What a treat it would be for folks to be considerate of others who share their space. Sadly, common courtesy has disappeared from present day culture. As I muse over the lack of consideration for others, I am struck by the actions of some who deliberately hurt others because they are not getting their way. It goes beyond my understanding that someone would knowingly cause great pain in someone else’s life, just so they can “make a point” or gain approval. I have always believed in the “live and let live” philosophy but there are some who try to make others miserable just to dictate their way of life. I can not wrap my simple mind around this concept. It is so foreign to me. The very ones who accuse others of being “judgmental” insist on having their way to the point of bringing great discomfort into the lives of those who simply disagree. With humor, I realize that good fences bring with them peace of mind. For being fenced in is not so bad a thing, if one is happy within their own realm of flowers and beauty. Life becomes as it should; focused on the small things that surround a person. It becomes a moment by moment experience and one that brings peace. After all, we are only promised our daily bread. Along with misty mornings and chilly evenings, spring has tiptoed back into my valley realm on soft, furry feet. While there is not a leaf in sight, each branch and twig is bulging with the promise of intense green, soon to come. Color is slowly returning, starting from the ground. Lawn grass is shedding it’s winter brownness and the first bright color of bulbs, planted the fall before, is showing up in many gardens. Of late, I have been spending much time at ground level. Down at a worm’s eye view I squint, first with one eye and then the other. With gentleness, I push soil and debris away from last year’s plants, just to see who made it through our long winter. Surprisingly, most have survived. Over and over again, I am astounded by the tenacity of these plants, to have endured months of sub-zero temperatures and piles of snow. What a lesson in fortitude! Soon, I will begin the pleasure of moving some of these plants to places where they are happier. 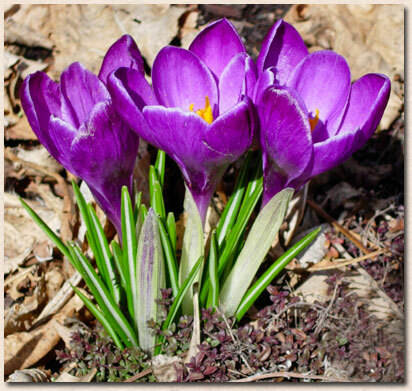 However, it is wise to hesitate a while longer and allow air and soil to warm with the spring-time sunshine. April is a happy month for discovery, cleaning, and transplanting. It is a time for fresh beginnings. And so it is with our lives. As I was lamenting the passing of my dear friend Eliot, just a few days past, I realized that his time had come and now it is gone. He left us during the month of Thanksgiving and as we were entering into the season of sleep. Now, with the arrival of spring, it is Bonnie’s time. With the coming of a new season, I realize that such it is with life. Beings and circumstances come into our lives and go out of our lives, with continuance and certainty. Many, many times I have wanted to hang on, for at times change is scary. But the “flow” must go on and I must go along with it. With the passing of time, we change. We do not look as we did in our younger years. Recently, I have been startled by the reality of this phenomenon. It is difficult to spot ones self in a mirror and not instantly recognize the face we have lived with for so many seasons. I have been marked with the stamp of time. But it is the way of things and very soon I realize that the image that surprised me, gazing back from the mirror is the way I am supposed to look. Long ago it was mapped out how I would look at each season of my life. During this time, I don long white streaks of starlight in my hair and faint lines of wisdom in my face. Although, for the life of me, I never have been able to figure out why it is we have to have those mappings of a life well lived on our faces and not on our limbs. At this point, I can truly say that I am older than the mountains, but younger than the stars.